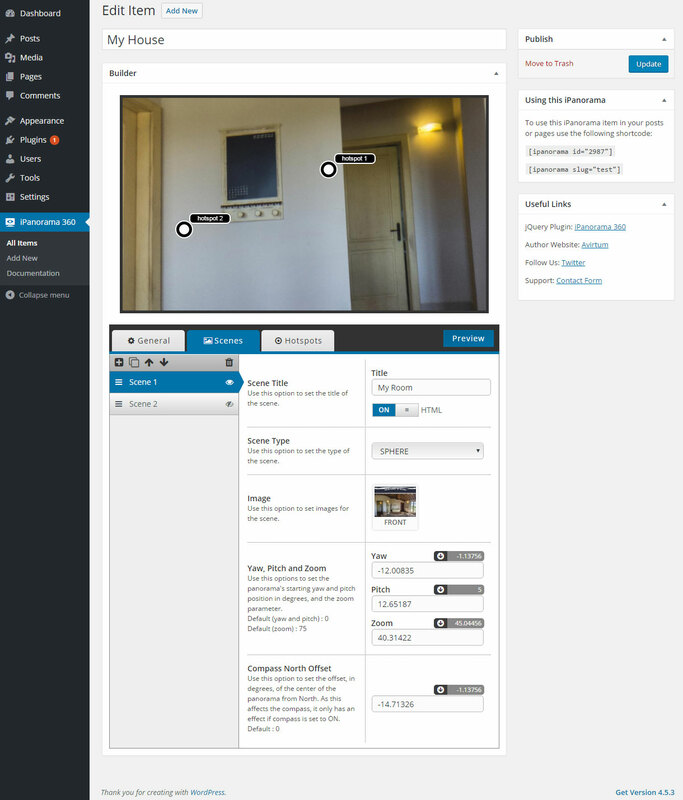 iPanorama 360 Virtual Tour Builder is the WordPress plugin that lets you create awesome virtual tours for your customers without advanced programming knowledge. Using the built-in builder you can easily upload your panoramic photos, add hotspots that allow the user to navigate from one scene to another, add popover windows to point out important information about any part of the scene. You can enrich a hotspot or popover window with text, images, video and other online media. 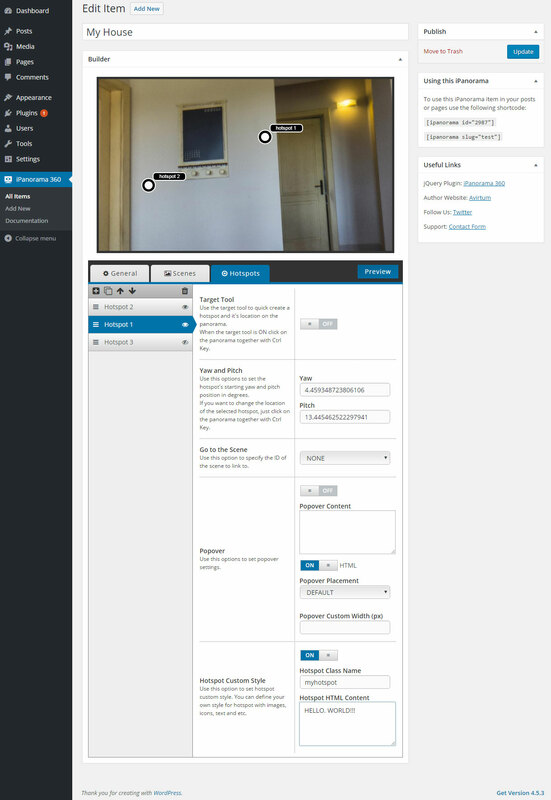 This panorama plugin is responsive and works on all modern browsers and mobile devices. Use this plugin to create interactive tours, maps and presentations. 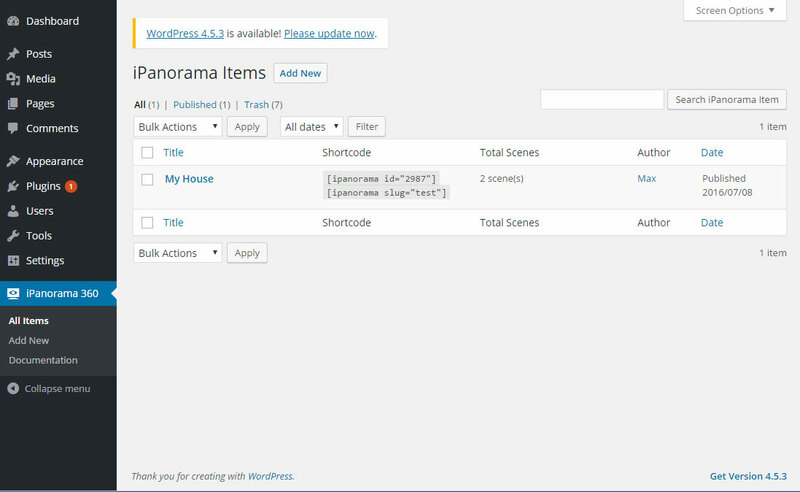 Also you can test functionality of the plugin builder using my web application here. This web application is included in the package of the jQuery version. A really awesome plugin at par with stand-alone virtual tour software that are priced at least 200 euros. I just bought a Samsung Gear360 camera and this plugin works wonderfully with my spherical photos. I will be buying another license soon. I can see using this plugin for vacation rentals, disc golf courses, real estate, and so much more. My question for support was resolved within a few emails/hours, which was quicker than I expected. Thanks to Max again for that. There is always room for improvement, so I’m looking forward to seeing this plugin evolve with growing popularity. I have been making Panoramas for many years. 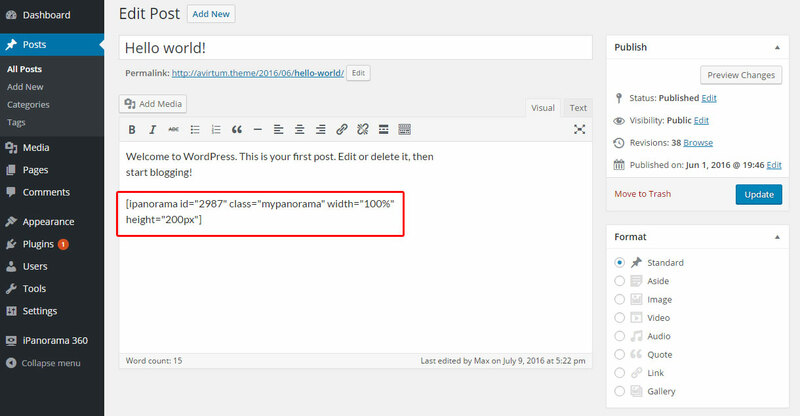 This is the best program I have found to use with Wordpress. Very easy and the results are great, Support is the fastest I have seen for any plugin and I have bought a lot of them. GREAT TOOL and very easy to use !!! !